Anastasios studied electrical engineering and computer science in Aristotle University of Thessaloniki. Then acquired a Masters degree in Biomedical Engineering with focus in Biomechanics from the National Technical University of Athens. 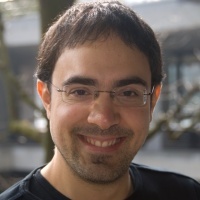 In June 2012 he finished his doctoral studies at the ETH Zürich in the group of Prof. Poulikakos and under the supervision of Vartan Kurtcuoglu, whom he followed to The Interface Group. In August 2016, Anastasios passed the batton to his successor, Claudia Danzer. He is now living in Sweden and working as a consultant at Alten. His first assignment was at Mölnlycke Healthcare, where he has been helping the healthcare solutions company develop better medical devices.